U Sedmi Svabu is an olde medieval style pub in the Lesser Town (Malá Strana), not too far below Prague Castle. 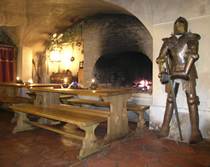 In keeping with the historic feel of this area of Prague, U Sedmi Svabu has a roaring fire (in the winter), suits of armour, stone walls and some cast-iron decor. It's dark and atmospheric, with tables lit by candlelight. For drinks, a fair maiden will serve you a cool beer, glass of wine, mead or a hot drink to your table, which in true medieval fashion is a chunky wooden bench. To reach U Sedmi Svabu from the Lesser Town Square / Charles Bridge, walk up Nerudova Street towards Prague Castle. After a brisk 5-10 minutes walk you arrive at an alley named Jansky Vrsek on the left. Descend the steps to find the pub. Enjoy an evening of terrific food, drinks and medieval entertainment in the Old Town.